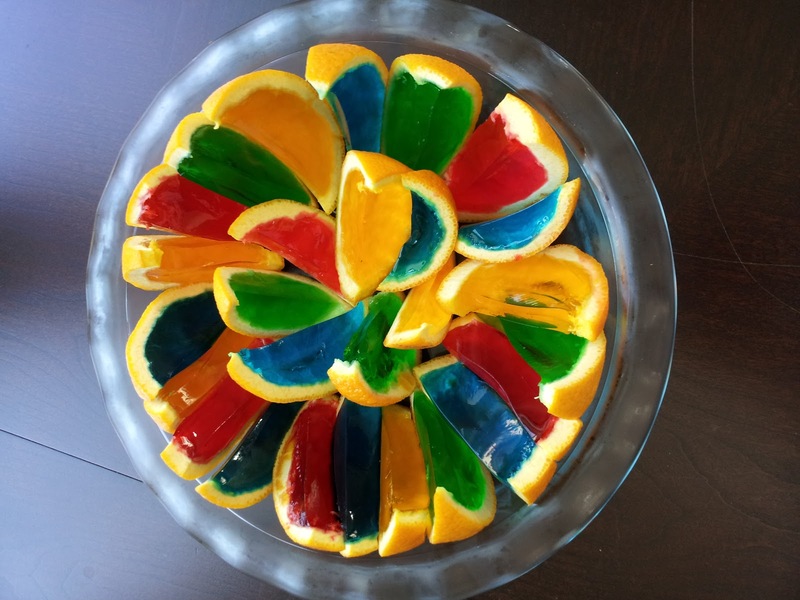 --> Prepare jello as per the packet instructions and let it be in a bowl. --> Cut each orange into 2 halves. --> Scrape out inside part of oranges. (you can make juice from insiders). Now you get the Orange shells. --> Arrange these empty shells in a tray that can sit in your refrigerator. --> Now pour jello liquid (prepared in first step) into each of the cut halves. --> Refrigerate jello oranges atleast for 5 hours. --> Take out jello oranges and cut into desirable size. Tip : Ice-cream scoop can be used to scrape out the insides of oranges. You can use as many colors as you want.